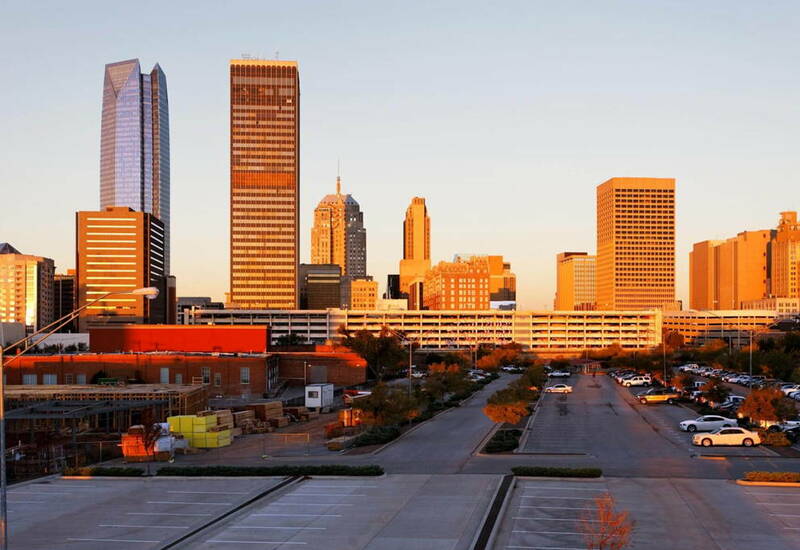 Hair Club Oklahoma City is located in a 10-story, black, glass building. It is the ONLY building over 3-stories for a 1/4 mile radius. It can be seen from blocks away. The building has a large "5100" across the sides of the top of the 10th floor. We are on the Northwest corner of 50th Street & May Avenue, just behind a 2-story red-brick building and a white church. PARKING: There is ample parking. We are handicap accessible. IMPORTANT NOTE: On Saturday, the building locks down at 1pm. Consultations that are scheduled Saturdays for 1pm and later must enter from the North side entrance, hit the intercom button and we will buzz you up. It is located in the North entryway on the right wall. It is the ONLY mounted buzzer and is labeled HCFM. 5100 Brookline Building is 10-stories tall and will be clearly visible on the right side of the street. It has a large "5100" across the side of the top of the 10th floor. If you pass OK-74 / OK-3 overpass, you have gone too far on 50th Street. The 5100 Brookline Building is 10-stories and will be clearly visible on the left side of the street. It has a large "5100" across the side of the top of the 10th floor. *If you pass May Ave., you have gone too far on 50th. The 5100 Brookline Building is 10-stories and will be clearly visible on the left side of the street. The 5100 Brookline Building is 10 stories and will be clearly visible on the left side of the street. *If you pass May Ave., you have gone too far on 50th. It was wonderful and she was wonderful. I am really happy with hair club. The ladies there always make me feel right at home every time I go. hair club has changed the way I feel about myself and has givin me a lot more confidence when im around people. thanks so much hair club!! Everyone at this center has been so wonderful - compassionate, caring and encouraging. When I went thru an intense situation with my hair last summer - every time I combed it, I had notably less hair, they were quick to get me in and restarted on the program. Very accomadating with my schedule and needs. I have found this to be the case with almost all the Hair Clubs that I have been too. Hair loss is an unfortunate situation to find yourself in but the Hair Club is the best establishment to go to for help. It's like "Cheers",where everyone knows your name. From the reception area to the stylists nothing but class,courteous and professionalism. I wish all the business I deal with were this pleasant. Love the style and the hair keeps getting better and better. They are so wonderful in this center. I always have a great experience at the Oklahoma City Center. Jody and her entire team do a great job! Great staff!!! Thank you Joe, Maria, and Jeneel. Your smiles and great service made the wait worth it. Special thanks to Shar. Very knowledgeable and a true expert. The people in the Oklahoma City club are marvelous. They are friendly, accommodating, and eager to make a person feel at home. I love my experience there and look forward to many more great visits. I am totally satisfied with the service, the quality, and the people. My hair started thinning when I was 24 and I was a little worried about getting it done at Hair club. I did not want it to look like I was wearing a wig or look completely fake and everyone to wonder what was up with my hair. I first went to the Hair Cub for a free appointment when I was 27 and even though everyone was really nice I decided against it, but this spring I went back (i'm 28 now) and had the biomatrix service. I have to say it was one of the best decisions of my life! My stylist (Tammy) made it look completely natural and people who have never meet me tell me what amazing hair I have. I wear it a different style everyday and at first I was worried about the upkeep , but they hold your hand and walk you through the process until you are comfortable on your own. And the staff is amazing from the day you walk in that door everyone one of them make sure you have an awesome experience. If you are considering having any services done from here I highly recommend at least going in and talking with them. -Daniel T.
My stylist, Tammy, is wonderful, made me feel beautiful. good service the one time i was in town. I've been a HCMW member for 6 years and have never regretted my decision. Not only do I get a product that makes me feel good, I get the professionalism of a first rate staff that cares about me, and my look. If you feel the need for a change in your life, stop wasting time and make the commitment to a new you. Make HCMW your choice. -Mike P.